Most women diet to lose weight, thinking that weight loss also leads to health. If we are honest with ourselves the main reason women wish to lose weight is to gain societal acceptance and improve self-esteem and self-worth. Going about weight loss in an unhealthy manner (even if you’re overweight) can lead to a whole host of hormonal imbalances that only lead to metabolic damage, weight gain and weight loss resistance in the future. You can read my article about dieting http://hazelandcacao.com/5-health-consequences-of-dieting/ to find out more. 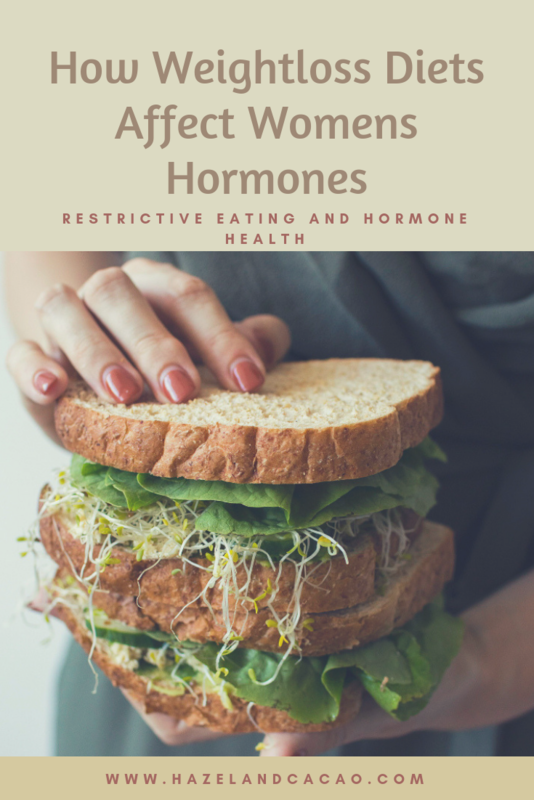 There is clear evidence showing that nearly all restrictive diets cause thyroid damage and women’s reproductive hormones get thrown off in the process. All diets involve some form of restriction either calorie restriction or a restriction of a certain food group (like fats or carbs) coupled with over exercising. These diets may work well in the short term for weight loss but the effects on our reproductive hormones can be quite dramatic. I wanted to break down the effects of the main types of diets on our reproductive hormones. Although this isn’t a diet, over-exercising can have a similar effect on hormones as overall calorie restriction. Exercise is good and absolutely necessary for overall health but over exercising adds significant stress to the body leading to a loss of period for many women (especially young women). The most important step is to break free of the yo-yo dieting habits. Every women’s intake of calories, carbs, fats, and protein is different and so it’s important to eat the amounts necessary for you. • Challenge the false belief that self-esteem and self-worth is tied to weight and overall appearance. Self-worth is intrinsic. I’ve written this article primarily as a response to many young women that are already at a healthy weight or more often are already underweight due to restrictive eating and dieting. These women reach out to me because they have lost their periods due to restrictive eating. Unfortunately, many women (young girls in particular) would rather sacrifice their health and emotional well being to look good and stay thin. I know that reframing our perspective from “weight” to “health and wellbeing” is not as easy as I may have made it sound in my points above. In reality, it is a very difficult process that can take many years to achieve. This is why eating disorders are so incredibly difficult to overcome and why dieting becomes addictive. I have personally been naturally underweight all my life (I never dieted). I hated being skinny and was made to feel ugly for my weight. This damaged my self esteem. Thankfully my health problems helped me understand that health is more precious than appearance but it took me many years into researching and understanding health to get me to this point. For those that are reading my article and are overweight, I plan to write an article about healthy weight loss to accompany this post soon. I hope in some way my article can shine some perspective on why dieting is harmful to our health and encourage women to seek healthy sustainable long term lifestyle choices that support hormones and fertility as well as healthy weight. I wish you luck! Research is so important for our health journey ! It’s the only reason I got better. Thank you for commenting.